Billionaires are a breed apart. Individuals who were able to navigate the often confusing, and always tough world of money making, to amass incredible wealth in the tune of billions of dollars. And Now, a large number of these billionaires will give wealth away for the good of the rest of the world. At no time in history has the welfare of humanity been in better hands. 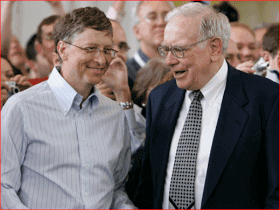 The Giving Pledge foundation was created in 2010 by world's richest man Bill Gates and Melinda Gates and Warren Buffett to use their fortune to solve the world's problems. After seven years, the world's problems are still not going away, although thanks to the fund, a lot of progress has been made, and many have felt the impact of the billions pumped into the world darkest problems by the foundation. The good news is that the fund just recieved a boost. 14 new billionaire members have just been added to its ranks. The Pledge encourages the world's wealthiest individuals and families to give the majority of their wealth away to philanthropic causes. They hail from every corner of the globe. 14 more individuals hailing from Australia, China, Cyprus, Monaco, Norway, Slovenia, Tanzania, and the United States, have agreed to Pledge. Here are some of the newest signatories. They include include easyJet founder Sir Stelios Haji-Ioannou; Harry Stine, said to be the richest man in Iowa; and Mohammed Dewji, the heir to the fortune of METL, the largest company in Tanzania. An impressive financial force. Quartz calculated the net worth of eight of the 14 new signatories and found they are sitting atop a combined $14.3 billion. One can never know if a handful of extremely wealthy individuals can solve the World's complex, and ever reoccurring problems, but this incredible and powerful gesture will certainly go a long way.